One of the greatest things to happen to RVs was the introduction of the EPDM rubber roof. Leak-proof and UV-resistant, this long-lasting synthetic rubber compound can stand up to all kinds of weather, wear and tear. Most RV industry experts consider EPDM rubber roofing membrane the most dependable, cost-effective and easy to maintain roofing material there is. What do I need to do to care for my rubber roof? 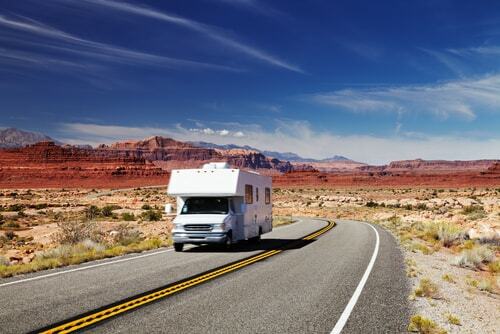 Clean your RV’s rubber roof at least four times a year, and more often if you live in an area with a lot of pollution. If I use a roof treatment product containing petroleum distillates on my EPDM roof, can that void my warranty? Yes. Only products free of petroleum distillates should be used on EPDM rubber roofs. I’m buying a used RV with a rubber roof. How can I tell if the previous owner damaged it? Swelling, areas of uneven thickness and loose spots are all signs that the roof has been damaged by petroleum distillates, which cause adhesives to loosen and the membrane to balloon. My roof seems to oxidize, which is especially noticeable when it rains. What’s going on? It’s normal for EPDM roofing membrane to oxidize slowly, and you may see some runoff when it rains. Regular cleaning will help greatly. What’s the best way to clean my rubber roof? Work on one three-foot-square section at a time. Using a mild laundry detergent mixed with water, scrub the entire roof with a medium bristle brush, then rinse thoroughly to avoid residue build-up on the roof or sidewalls. You can use household bleach for more difficult stains, but do NOT use cleaners that contain petroleum solvents or harsh abrasives, as these may cause irreparable damage to your roof. The edges of my rubber roofing can be seen from the ground, and don’t look good when they get dirty. What can I do about this? After cleaning, many RVers treat visible parts of the rubber roof with an EPDM-safe protectant to clean and protect against future stains. Protectants can also help minimize messy, though natural, oxidation. 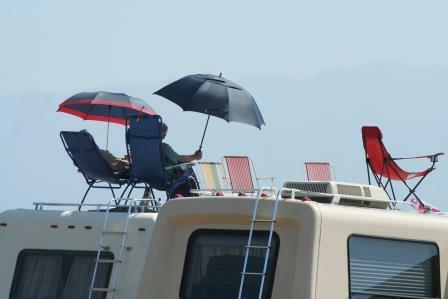 Now that you’ve cleaned and protected your RV’s EPDM roof, take a minute to learn how to clean & protect your RV awning. I would just like to find out if I can kill mould with vinegar on the epdm roof and edges. Does the vinegar damage the coating. We have not really tested vinegar-based formulas on EPDM and what effects may occur, so we would rather recommend trying and actual mold/mildew remover such as 303® Mold & Mildew Cleaner + Blocker. RV rubber roof repair is the way to go when you get a leak. Just be sure it’s EPDM and that you handle the job right away. Liquid rubber RV roof coatings are typically formulated using a kind of liquid EPDM coating which can be quickly and easily applied to an entire RV roof or just to small sections of it, if desired. This kind of formulation is designed to dry quickly after being applied to the roof of an RV, and has been proven to be equally strong and durable as a factory applied RV roof.